A couple of weeks ago it looked as if gold’s 2017 rally was fizzling out. Then the Federal Reserve acted on a telegraphed interest rate hike and accompanied the upward adjustment, only the third such move in a decade, with surprisingly dovish comments. Rate hike expectations for the rest of the year were dialled down despite signs that inflation could soon creep above the central bank’s targeted rate. The dollar fell and so did yields on US government bonds, exactly what the gold price needed. On Tuesday gold futures contracts on the Comex market in New York touched a high of $1,258.40, up more than $50 from levels just before the Fed announcement and showing gains of 9% so far in 2017. Perhaps the single greatest misconception about gold, especially in contemporary trading circles, is the erroneous belief that rising U.S. short-term interest rates are inherently threatening to gold’s prospects. We believe rising rates have far less to do with gold’s performance than the reasons why rates are rising and whether the Fed is deemed to be “in control.” After all, when gold exploded to all-time highs in January 1980, the Fed’s discount rate was 12% and fed funds were targeted at 14%. Many will object that the January 1980 experience is not germane, because conditions in 1979 were substantially unique (inflation, oil shock, Iran hostages and Hunt brothers). Conceding all decades are different, we turn to the more recent past for evidence rising rates can coexist with surging gold prices. In Figure 4, we plot the Fed’s target fed funds rate versus spot gold from mid-2003 through early-2007. Between June 2004 and June 2006, the FOMC increased its target funds rate by 25 basis points at 17 consecutive meetings! During the span, fed funds more than quintupled, from 1.0% to 5.25%, yet spot gold climbed as much as 86% along the way (from a $392.55 close the day before 6/30/04 liftoff to an intra-day high of $730.40 on 5/12/06). 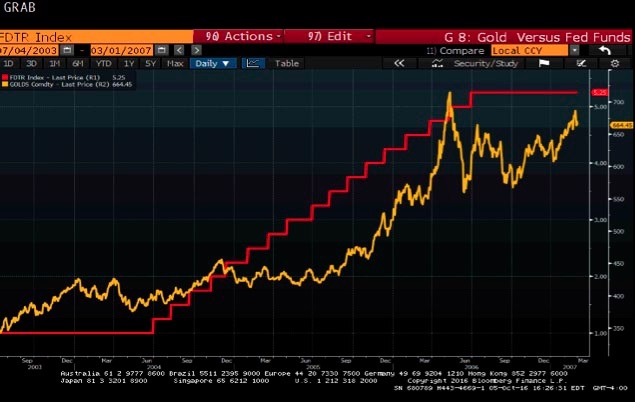 Obviously, Fed tightening has far less reflexive impact on the gold price than commonly perceived. Should the Fed have the temerity to push fed funds along the confines of their most recent dot plot (three hikes in 2017, followed by three more in 2018), we would expect immediate upticks in default rates across a wide spectrum of sketchy components of the U.S. $66 trillion credit-market debt pile. In an environment of long-overdue debt rationalization, we would expect gold’s traditional profile, as a portfolio asset immune to both default and debasement, to garner significantly renewed investor enthusiasm.